This weekend, our unseasonably warm Perth winter finally turned cold and rainy, which meant perfect circumstances for reading a book about a world that is almost totally under water. 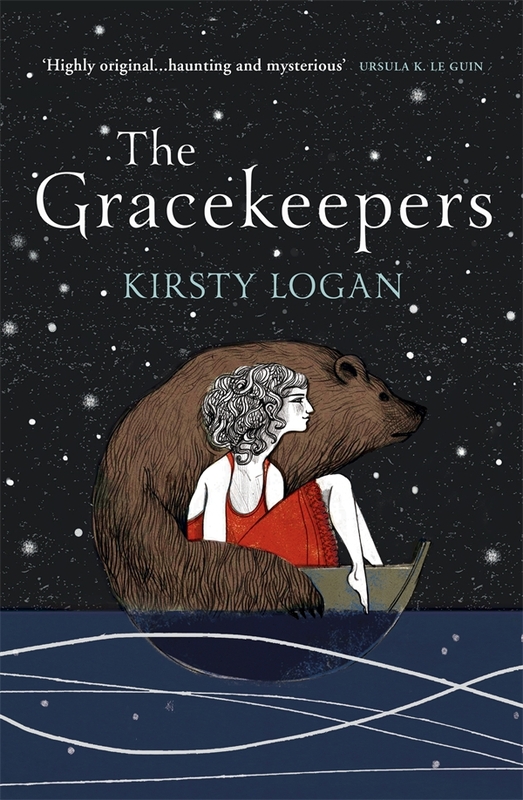 This book was Kirsty Logan's The Gracekeepers, a fantastical and yet oddly real novel about two girls, a floating circus and a bear. How marvelous it was to listen to the rain beating down on my window and the wind howling outside, all the while imagining myself floating away on a stormy sea with a brown bear for company. 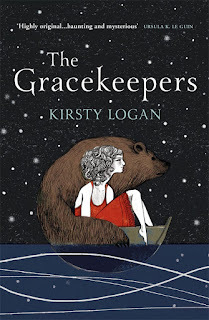 The Gracekeepers is the story of North, the bear girl, who performs each night with her trained brown bear on board the Circus Excalibur, a circus on a boat which travels between island archipelagos to entertain the Landlockers, or people who live on land. North and her people are Damplings, an outcast minority of people who choose to live on the sea, even though the sea is now most of the world. The old world, our world, is still present under the surface. This new world is one of superstition and darkness, where babies who are born with fins or gills are buried alive under sacred trees and damplings must wear bells on their shoes when they come on land so that everyone will know what they are. North carries a secret within her that threatens her future on board the Excalibur; she is carrying a child within her, and the baby's father is a merperson though she barely remembers the encounter that bore such strange fruit. She continues with her act, letting out her clothes as long as she can, taking it one day at a time. When tragedy strikes during a ferocious storm, North and her circus family travel to a graceyard, perhaps a lingual relation to our own graveyards, where bodies of those who die at sea are interred under the water, and the bereaved are presented with a grace, a bird in a cage which will mark the time of grieving's end with its death. Here, North meets Callanish, the gracekeeper, who wears silk gloves and slippers to hide her webbed fingers and toes from the world. North and Callanish are drawn to one another in a way that cannot be expressed in words, but Logan does an excellent job of expressing what they are to each other. When Callanish and North go together to see the bear, Callanish takes her gloves off in front of another person for the first time in order to feel the animal's fur, and instead of running away, North's reaction is to hold Callanish's hand a little tighter. This is a beautiful image, one that fills the reader with a lovely warm feeling and gets to the heart of why this book is so comforting. The women are separated by vast amounts of ocean but they journey back to one another, knowing that together they will find what they both need. This is a book about grieving, about love, about family and about survival, but it is also a fairy tale and is lovely and terrifying and strange in the way that only a fairy tale can be. Gender and sexuality are fluid constructs in this novel, but in such a gentle way that it becomes clear this is a novel about people, and not about men or women or gay or straight love. This is a novel about bigger constructs, about feelings that cannot be labelled. Kirsty Logan's love of words and language is evident with every sentence she crafts; her words are pared back but powerful and she says so much in short scenes that the book is soon over, but not forgotten. It is a truly beautiful book and I gave it five stars. Available now. To order from Bookcaffe, click here.